Glacier Peak Resort, on Highway 20 near Marblemount at the western entrance to Washington State’s fabulous North Cascades mountain range, awaits your visit. Situated at the historic village site of Bullerville, the Resort is the perfect place to unwind. It has been described as one of the most restful, relaxing, feed the rabbits, favorite place to kiss, listen to the frogs, places in the North Cascades. Open year round, the atmosphere is homey, the rates are reasonable and the unique accommodations are ideal for just two, families or larger gatherings. Located on the western approach to the North Cascades National Park , we house many folks who stay to enjoy our majestic mountains, whether by hiking, rafting, mountain climbing or just driving the highway or back roads to absorb the splendor of the alpine forest, abundant waterfalls and glacier-covered peaks. We are less than two miles from the park’s Back-Country Information Office where you can inquire about the many things to do and see in this young park. Backpacking permits and trail maps are available. The Park’s boundary is about seven miles east of us. Glacier Peak Vineyard and Winery‘s tasting menu offers a rotating list of 5 great wines for $5 (waived with one bottle purchase per tasting. Reservations are not required. However, if you have more than 8 people in your party please call ahead so we can properly accommodate you and provide the best tasting room experience possible. In addition to our wine the tasting room features gourmet, locally sourced cheese and a selection of other goodies. Feel free to bring your own picnic basket, purchase a bottle of your favorite wine, and enjoy a meal among the vines. Directions:Take Exit 232 from I – 5. Head east on Cook Road, then east on Highway 20. 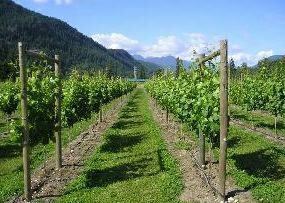 The Resort is east of Rockport on Clark Cabin Road and the Winery is located just beyond at Milepost 104.